For some reason, the documentary What the Health has gotten so popular that some of my work colleagues are often discussing. Some have even turned vegetarian after watching this documentary. I haven’t really watched it myself, but I heard it is actually scarier than horror movies. Then I think to myself: There hasn’t been a day in my life that I could remember, in which I did not eat meat. Maybe such days exist, but I seriously cannot remember. I’d like to think that I am not addicted to meat and any animal products (or addicted to anything really), but how would I know without doing it? 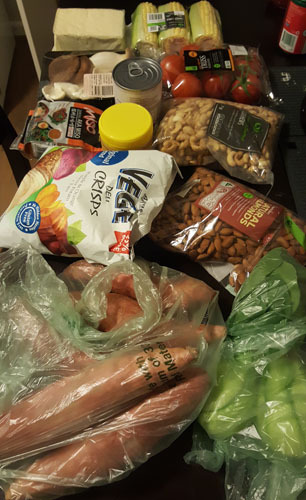 So I’m going to challenge myself (and my wife) to become vegan for a week. Previously, I have also done a similar challenge with coffee. I am a big coffee lover and consumer, I can drink from 2 to 4 cups a day. So one week without coffee was really difficult. Though I finally accomplished my challenge, but for the first 3-4 days, my option was either having withdrawal-symptom-headaches or being high on Panadol. Like vegans, vegetarians do not eat any animal flesh; no chicken, pig, cow, sea animals, nada. A vegan – in addition to not consuming any animal meat, doesn’t eat eggs, dairy products or any other product derived from an animal. Vegetarians, on the other hand, tend to eat eggs and dairy products like milk and butter. 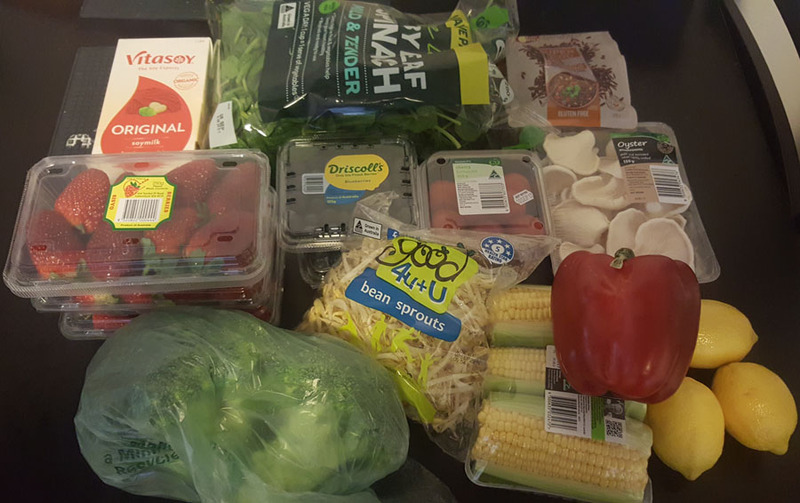 Went shopping at Woolworth on Saturday to buy some vegan groceries. 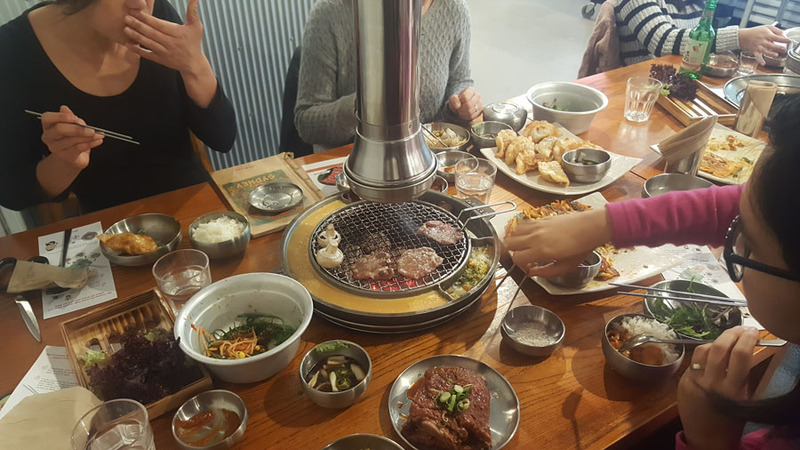 To say goodbye to meat (for a week), we went to a Korean BBQ restaurant near home. Had soy piccolo in the morning (yup, caffeine for breakfast). For lunch, we made some vegetables that we bought yesterday into Indonesian pecel with red rice – just add some pecel (peanut) sauce on it. I’m not sure if it’s psychological only or it’s a real thing, I didn’t feel the food was adequate and kept on eating more. I needed to have 3 full meal just in the afternoon before 6 PM. It seems likely that my body needs to compensate the lack of meat with more food. The vegetables didn’t last long, so we went grocery shopping again (and made our first mistake). The Vege Crisps – When we look at the backside of that vegetable crisps after arriving home, turns out that it may contain traces of dairy. So the crisps will have to wait for a week. For dinner, we made miso soup with tofu, mushroom and some random vegetables. I woke up really weak, feeling light-headed and dizzy. This weakness stayed on until lunch time. However, the stiff-neck and headaches I have been having lately, also went away. I’m guessing these headaches were related to my high cholesterol (it runs in the family). We have been eating so much crap in the past couple of weeks or so. As usual I had coffee (soy) in the morning and some home-blended juice of fresh fruits and vegetables. Since it is “vegan week” at work with my old team, we went for lunch together today (and plan to do this for the whole week). 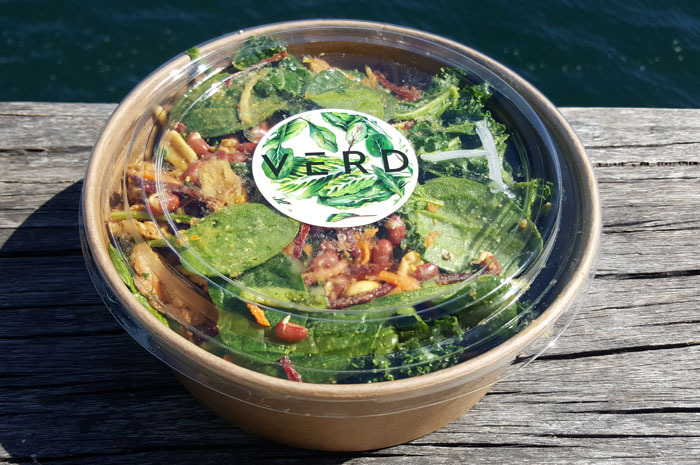 Today we went to Verd in Barangaroo. My friend Brooke has the restaurant’s app so we can pre-order our meal. I ordered Raw Rad Thai (greens, tofu, shredded carrot, beet and daikon, adzuki sprouts, peanuts, coriander, mint, with a zesty coconut satay dressing) with additional tempeh bacon. Today, I also had a 2.5-hour workshop in the afternoon, in which snacks were provided. Unfortunately some of the snack packs were written in Japanese (or is it Korean – I’m not sure). So I couldn’t read the ingredients. Therefore I did not touch these snacks. Dinner: Leftovers from yesterday – miso, and Indonesian pecel vegetables with peanut sauce. Soy coffee and home-blended fruit and veggie juice for breakfast. For lunch, the team went to Iku at Westfield. I ordered their Tomato & Vegetable Lasagne. Had a red velvet vegan donut from the Doughnut Time for dessert. For dinner, the wife and I went to Mother Chu’s in Pitt St. Sydney. 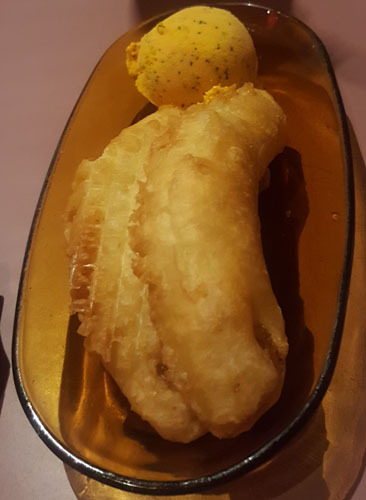 We had some vegetables dumplings, some random chef special stir fried tofu mushrooms, steamed egg plant & crunchy soy nugget with basil sauce; and also banana fritters with tofu ice cream for dessert. I think our bodies have started to get used to the vegan diet, although we still feel weak sometimes during the day. But the junk & fried food for dinner has made our day. Oh and we found out today from Googling around, that Indonesian Indomie goreng (the instant noodle) is unsuitable for vegan. Damn, there goes our guilty pleasure plan. Wow I feelt perfectly normal today. I stopped craving for meat (no, I will not give up meat after this 7-day challenge), and no longer feel weak during the day, apart from the common hunger closing into meal times. For breakfast, I had home-blended juice and veggies (as usual) and coffee with almond milk instead of soy this time. I think I like almond milk more than soy. My workmate Justin and I had some snack at around 10.30 AM (more like I stole his food). 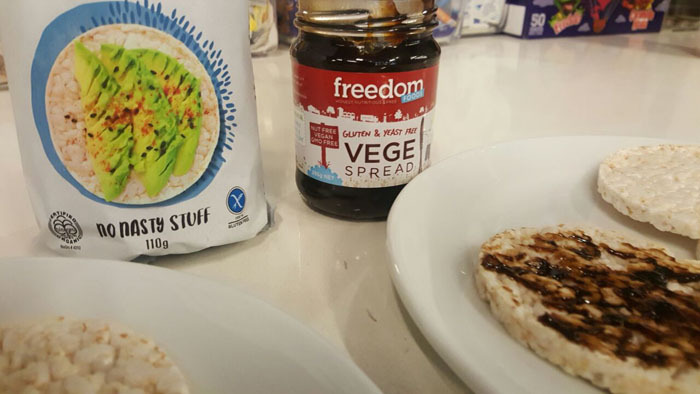 We had brown rice cake with vegan vegemite. 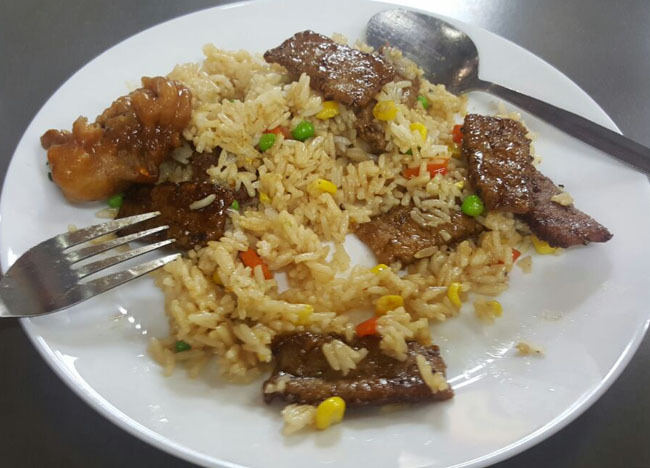 For lunch, the vegan-week team went to the Dixon House Food Court in China town. 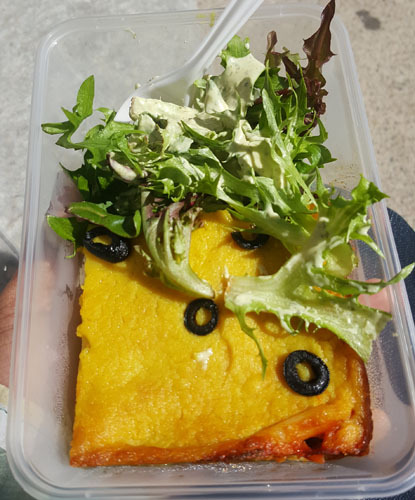 We went to a stall that serves only vegan food. This place is amazing, it is only manned by one lady who juggles between taking order and cooking. I ordered friend rice with some fake meat (I think it is made from soy). I’m actually impressed, it taste fully like beef. For dinner, we had some leftovers from yesterday, nothing special. Totally got used to this now. Got a 2-hour workshop again, during lunch time. Meals were provided, but I was invited to the session last minute, so I haven’t asked for a special vegan dietary. I had to have some snacks at 11 to be safe. 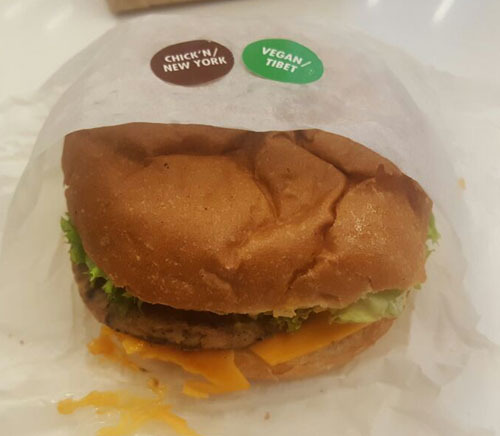 After the workshop, the vegan week group bought me some vegan chicken burger from Lord of the Fries. Perhaps because I haven’t had any meat in 5 days, the chicken taste like the real thing. Appetiser: Salt, pepper, coriander, tempura vegetarian ‘prawns’. Main: Wok tossed medley of mushrooms, asparagus, soft tofu, cashew nuts, creamy coconut lemongrass sauce, pastry nest. Main: Vegetarian peking ‘duck’, hoisin sauce, cucumber, pancakes. Dessert: moist sticky date pudding, rich coconut butter scotch sauce, vanilla ice cream, tart berry compote. I have been to Bodhi before, actually. During my previous visit, I complained to myself that the fake meat tastes silly and I didn’t really get the point. But this visit, damn everything tasted so good. Unfortunately there’s not much to report on today. My body was feeling good, I didn’t crave for meat that much anymore and feeling content with the food intake. Had breakfast as usual, coffee (with almond milk) and home-blended fruits and veggies. 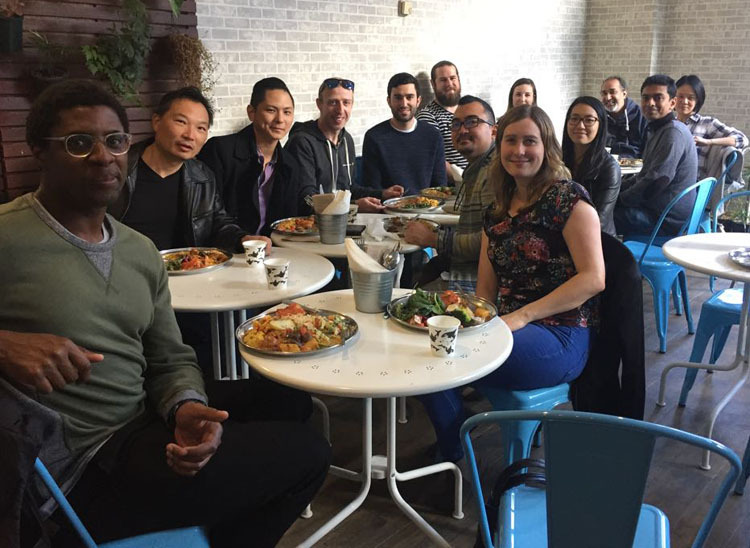 The lunch was a bit special, we had a grand vegan-week-team lunch at OM Vegan Kitchen in Surry Hills. 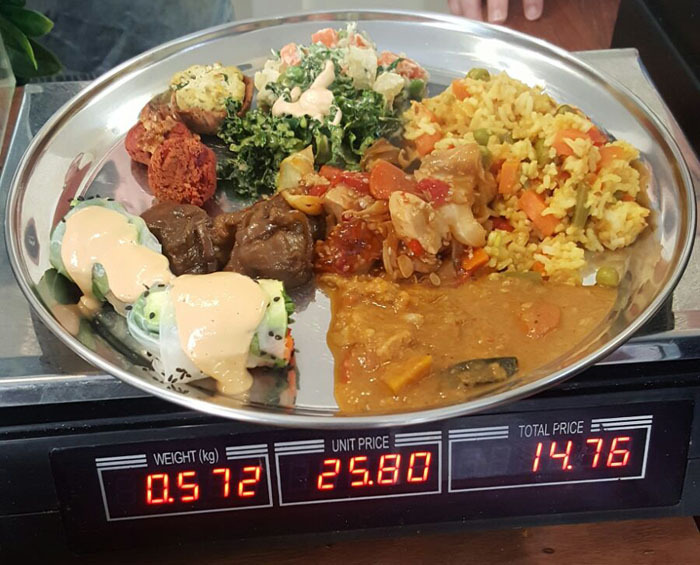 OM Vegan Kitchen serves the meal in a buffet style. Food are measured at the cashier and charged according to the weight. 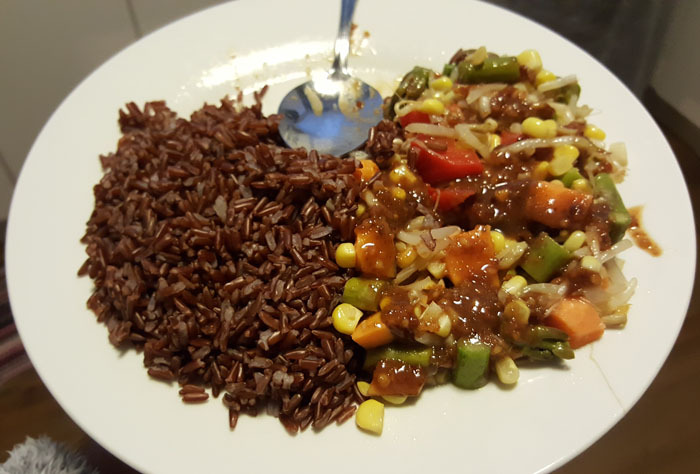 Had a modest dinner at home with some red rice and vegetables. Tomorrow is my 7th and last day of being vegan! 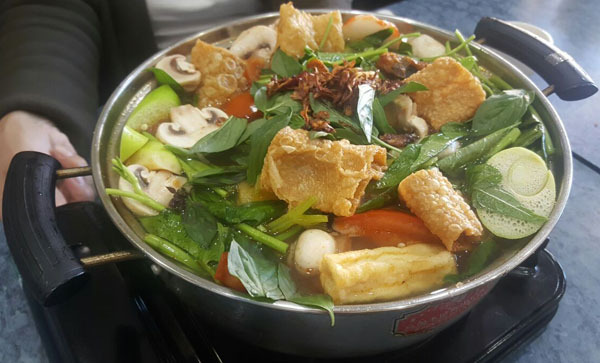 As today is Saturday, we planned to spend the day out to the west, visiting a friend’s baby at the Penrith Hospital and also to Cabramatta (the Vietnamese town in Sydney). Had breakfast as usual – nothing special. Then we were picked up. These people who picked us up, were very nice to have brought some food for us (bless them). But we told them that we couldn’t eat their food today, because we are vegan today (for the last day). They had some troubles understanding the concept of not eating meat, as well as our decision to experience this. I must admit that I felt like being judged and ridiculed. This must be happening very often to everyone who are vegetarian or vegan. 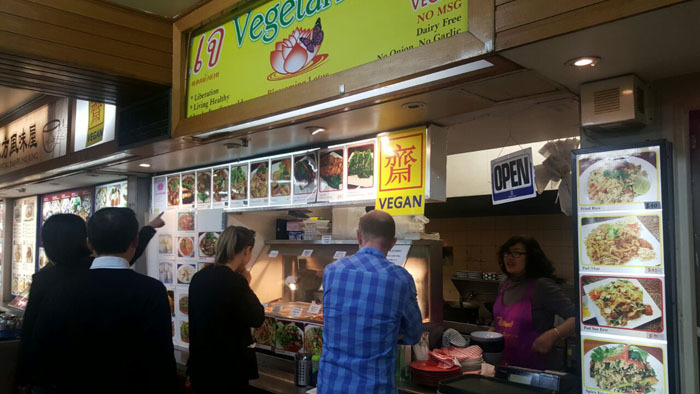 In Cabramatta, a simple search on the Happy Cow website brought us a list of vegan restaurants. 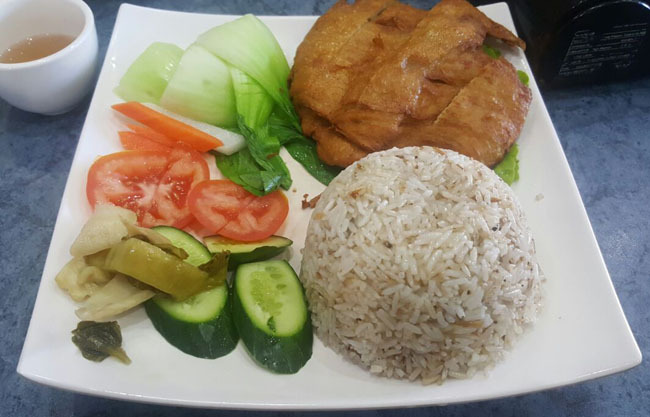 We chose World Vegan due to the number of positive reviews on the site. I had Hainanese chicken rice (with fake chicken of course), and others had Tom Yum Steam Boat. Their food is really good, I recommend! Even the people who went with us, who were “confused” about the not-eating-meat concept, really enjoyed the food. 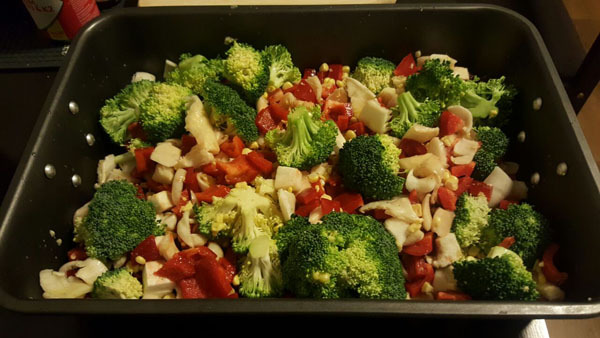 To close my 7-day being vegan, my dinner was some more random home-made vegetables. And this concluded my special week. Very proud of my wife and myself for accomplishing this! Because we didn’t know what we were doing, we had to read the backside of every piece of food item to check its content. 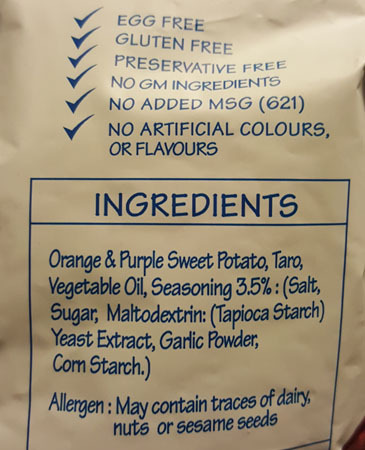 And even then, we still made mistakes (bought vege crisps that may contain traces of dairy). Had to Google many things. For example, whether or not honey can be part of vegan diet. We found some contradicting resources with this, so we decided not to consume honey. Not being able to eat snacks or food provided in a communal event, if the ingredients are not known. Not able to eat Indomie goreng instant noodle!! Had to bring meals, just in case suitable meals aren’t provided. Having other people question and ridicule our meal choosing; Having to explain multiple times (and we are doing this for a week, imagine doing this for the rest of our lives). Lost over 1 kg on the 2nd day. Not sure if this is the vegan thing or the fact that we are much more conscious of our food consumption. 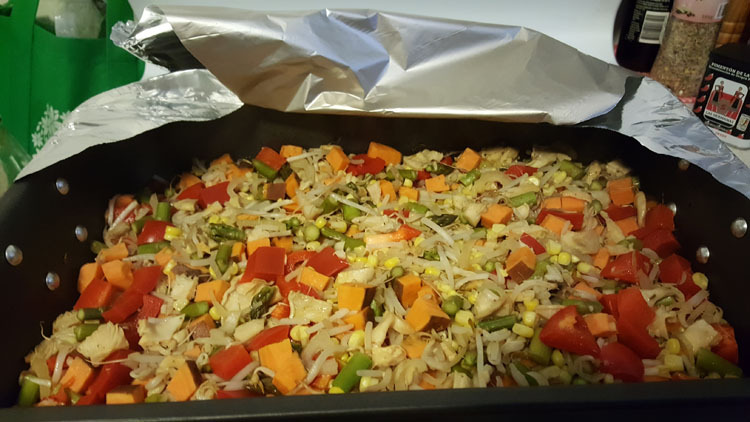 I replaced white rice with red rice, for example. Headaches went away. Perhaps due to drop in cholesterol. Felt less hungry at 5-6 PM. Usually the food crave kicks in around this time. Gained back the weight after several days. Perhaps the body needs to compensate the lack-of-meat-shock with eating more portion.